This article will explain to you how to calculate the axis of symmetry of a parabola for the standard x-y coordinate plane. Also, you need to know about the vertex of parabola and how is it related to the axis of symmetry. Further, you will understand how to calculate the axis of symmetry from a quadratic equation. The word symmetry means balance that can be applied to various contexts or situations. The symmetry is common for figures where you have to divide the shape in equal parts. It could be lines of symmetry, axis of symmetry or more. In this post, our focus in axis of symmetry in the x-y coordinate plane. Consider the given image whose axis of symmetry lies over y-axis. The vertex of this parabola is an ordered pair (0, 0). The axis of symmetry in case of parabola goes through the vertex of parabola. 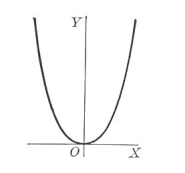 In other words, this is a vertical line that passes though the x-coordinates of the vertex. In most of cases, parabola has perfect symmetry but it is not necessary that the line of symmetry will always lie on the y-axis only. Also, it could be either on the left side or the right side of axis. Parabola could open the axis of symmetry either upwards or downwards. But all of these cases will not be discussed in detail here. a and b are coefficients of x2 and x respectively. c is a constant term. Here, we will only check what is axis of symmetry and its significance in mathematics. A depth understanding of the topic will always help you in understand the concept in best possible manner.